Flora: Come on, let’s go! Natani: The forest… my home, it’s burning! Flora: There’s nothing we can do. I see the river over here, come on! 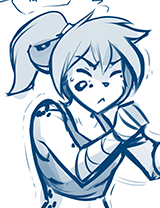 Natani: Grr… I don’t need your help! Why are you helping me anyway? I was just trying to kill you! Natani: Huh? Where did she go? Flora: I’m helping you because I don’t want more people getting hurt. Flora: Your brother showed me that even assassins like you are people too. Besides, I saved your life. You me now. And I want you to help us. Natani: Feh! How do you know I care anything about life-debts? Flora: I think even someone like you still follows the code. But even if you don’t, what options do you have?